This picture is taking form the LEM. You can see at least two abnormalities here. You can see an abnormal shadow (E) on the suface of the Moon. NASA says that this is the shadow cast by the Lunar Module, but on Earth, when an aircraft is flying low, it does not produce such a shadow. Also (3) there is again no stars in the sky. In fact, if you look at all the pictures you will never find any stars. Take a look in areas (6) and (J) and you will again see no stars. You will also notice that one side of the LEM (K) in covered in shadow, but the US flag is illuminated. This looks as if it could have been a touch up job in a lab. 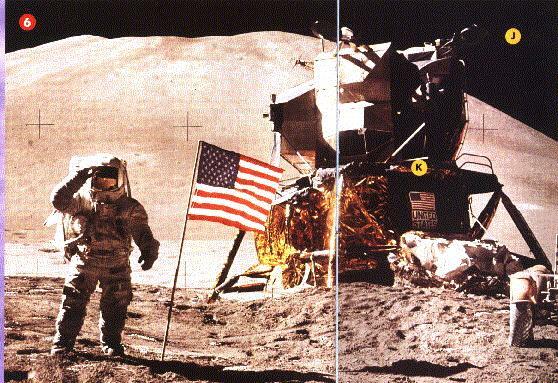 This is a picture of Alan Bean holding a Special Environmental Examiner Container. This picture was taken from a camera that was strapped to another Astronaut's chest. If the camera was attached to the chest, the top of Bean's helmet (L) should not be in the picture. All the shadows that are reflected in Bean's visor (M) are going off in different directions, not in parallel lines. 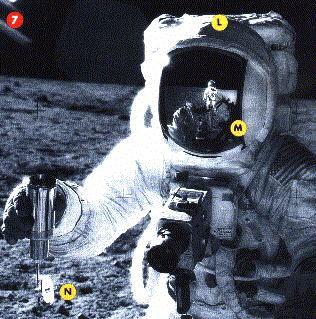 Look at the Environmental sampler that Alan Bean is holding (N). The reflection is coming form a light source other than the sun. But is it possible that the light is being reflected off the space suit? There is also something strange (7) in the sky. This is yet to be determined what it is. In the last picture, look at the circled part of the picture. These Lunar Rover tracks are very well defined. Well, to get such defined lines you need a mixture of a compound, and water. Next if you look at the rock (R) you will notice a letter C carved in it. Was this left by the props department? This is a portion of the previous picture. Look at the cross hairs on the picture. 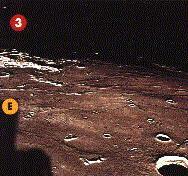 These appear on every lunar picture. These cross hairs are placed between the shutter of the camera and the film. 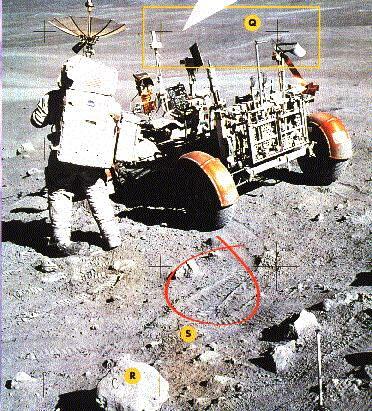 If you look at the cross hair on the left, you will notice that it was palced behind the lunar rover. You can see the lunar rover is in front of the hair. About 20 miles above the Earth, there is a radiation belt named the Van Allen belt. No human can get through this belt. If you try, you will get hit with 300+ rads of radiation. This is unless they are surrounded on each side by 4 feet of lead, which the space capsule did not have.